The Crown’s Game takes place in Russia, in the early 1800’s. Vika and Nikolai are both enchanters, trained in their magic so they can one day take the role of the Imperial Enchanter, a secret but crucial job. But there can only be one Imperial Enchanter. 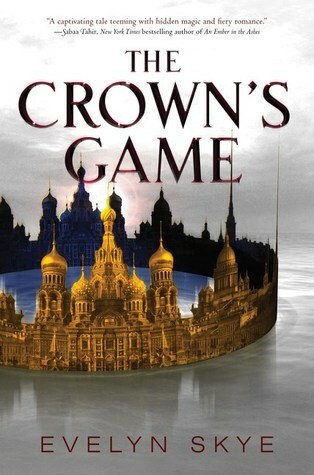 In order to decide who will work for the Tsar, they are forced into The Crown’s Game. A game of magic and skill, where the winner gets the title, and the loser must die. Evelyn Skye knows a lot about Russia. You can tell on every page of this book that she knows what she’s talking about. She included so many small details that a lot of authors would probably ignore, and it pays off. You feel immersed in this world. The magic system is also well written, with nothing vague yet also allowing room for the characters to surprise you. The plot is somewhat similar to The Night Circus, with a competition between two magic wielders, and only one will survive. It’s a little slow at first, as we meet the characters and they begin to understand the circumstances they’re thrown into, but the second half picks up and will leave you dying for the sequel. The one big downside to this book is the love triangles. There’s two. And one really bothered me. It just felt a little unnecessary. That said, the other love triangle was handled well (it probably helps that I went in expecting it). The characters themselves are really interesting, with realistic flaws and goals. You find yourself starting to care for them slowly through the book until you’ve reached the end and your desperate to see how their story ends. The Crown’s Game is an addictive historical read that will whisk you away to imperial Russia and captivate you with shows of incredible and unique magic.